Amaluna's protagonist Miranda in the water bowl. Courtesy of Cirque du Soleil. Lizard men, secret bands, a giant bathtub, and plenty of absurd human bending awaits you in Grand Prairie. A couple months ago, an intriguing media alert landed in my inbox: Cirque du Soleil was coming to town. This seemed like a fun activity until I invited a friend to join me. She was literally the most excited I’ve ever seen her in our six-year friendship, and she’s an overtly enthusiastic person. My expectations skyrocketed. Obviously, this was going to be one of the best nights ever. Anyway, that magical day, potentially the most incredible of my life thus far, came on Thursday. It was balmy when I made it to the blue and yellow striped big top tent at Lone Star Park in Grand Prairie. I saw Jonathan Zizzo, a local photographer whose work frequents the pages of D, at the will call table. He commented “You’re too cool for cats, huh?,” referring to the fact that I didn’t go to the Amazing Acro-Cats, but did attend this acrobatic event. I am not too cool for cats, I replied, I was sick last week and frankly devastated to miss it. I made my way through the tent, stepping into a haze of popcorn-scented excitement, and making a beeline to the VIP Hennessy lounge, naturally. This was not somewhere I was allowed to go – fair enough. However, I did have some really bomb seats in the second row, next to a former colleague from PaperCity Magazine whose commentary I relish, and directly in front of Real Housewife of Dallas LeeAnne Locken. (I also relish seeing LeeAnne, and I see her often. I wonder if she recognizes me from all our near encounters, but then I remember I’m not the one on a Bravo TV show.) I told my date that we were sitting by a Real Housewife and, once again, he was only moderately amped. The lizard who spills popcorn in Amaluna. Courtesy of Cirque du Soleil. LeeAnne and I sat there, sipping our complimentary premiere-night champagne as the lights turned low and some jungle-like sound effects started echoing through the room. Suddenly, a lizard man emerges, right next to my date. He moved his tail with impressive prowess and I realized that we were in the danger zone: Close enough to the stage to be called upon. I avoid eye contact. The woman in front of me doesn’t, and Mr. Lizard starts munching on her popcorn bit by bit before grabbing the bag and pouring it all over her, and me, and my date. Chuckles are had. A woman in renaissance-style garb appeared from somewhere and began scolding the lizard man. A staff member quietly brought a new bag of pricey popcorn to the lady in front, which seems like an important detail to include. Wait, there’s a full band playing? They were in the shadows of the stage, and actually very good. Think early Shakira, if Shakira was in the Trans-Siberian Orchestra and lived on the Avatar planet. There were people hanging from the ceiling, too. There’s no use in me trying to give you a play-by-play from here; it got wild and there were a million things happening at once. A big, clear glass bathtub was in the center of the rotating stage, and our main character did an incredible handstand balancing act atop it before splashing around, and, as the program puts it, “expressing her sinuous sexuality.” The floors were dried, and uneven bars were brought out, along with a troop of Avatar-like ladies. This was like a renaissance faire meets almost-Olympic gymnastics, and it was undeniably impressive. Then there were the incredibly bendy folks on aerial straps, the high-flying Cirque men bouncing off teeter boards, and much more. Uneven bars in Amaluna. Courtesy of Cirque du Soleil. There were a few lulls in the program. I don’t want to sound like a jerk, but there was a little too much “story” to the performance. To be fair, I guess it’s impossible for people to contort their bodies into pretzels and fly through the air in hoops for two hours straight, and maybe some people prefer there to be a plot. When things got slow, my mind went to the life of these performers when they’re outside of the tent. How many hours do they train for this? Where are they from? How does one get so bendy? Tickets aren’t cheap – they start at $50 – but is the talent being compensated fairly? For some reason, this really stuck with me. There’s something very somber to me about the circus – apparently even when it’s sensual and French. 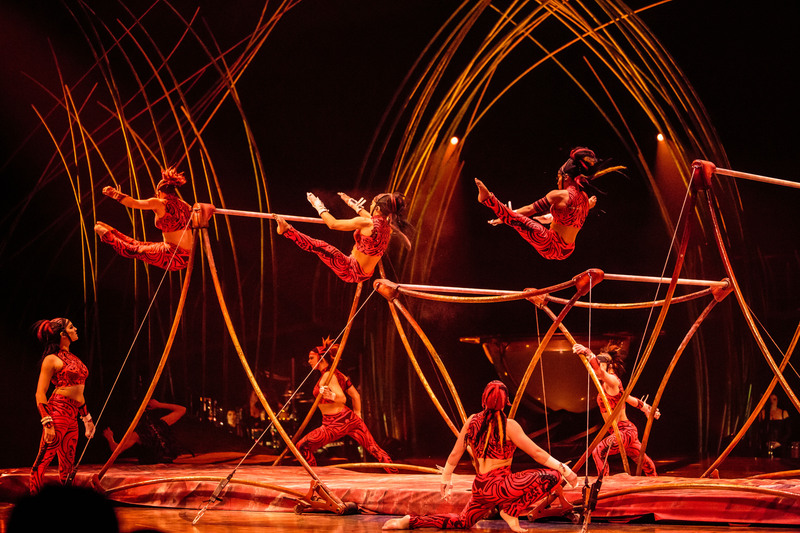 The next morning, I fell down a Reddit hole, which suggests that the conditions for performers with the Cirque du Soleil company are actually pretty good, which gave me some peace of mind. Still, it seems insane that these people can do this for two hours a night, many nights a week, for months on end. Considering that, is it worth the price of admission? Hell yeah. Would I spend my hard-earned money to see it? I’m not quite sure. I’ve never been one for the circus, and maybe this just wasn’t my thing. 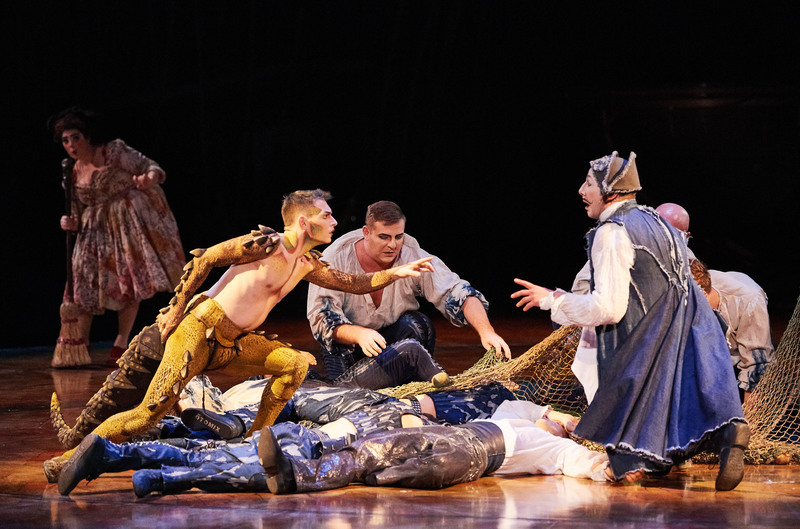 But, if you’re already a fan of Cirque du Soleil, of acrobatics, or of gymnastics, Amaluna won’t disappoint. The event is ongoing until March 3.